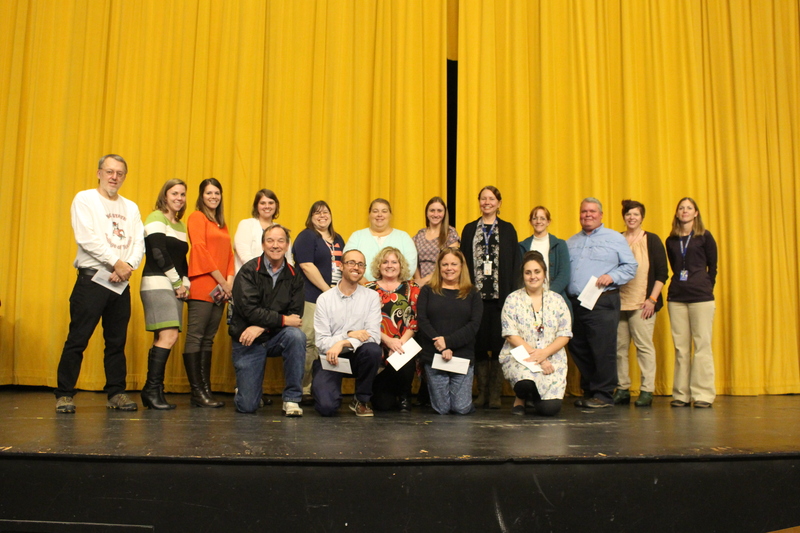 The Haywood County Schools Foundation recently recognized employees celebrating 5, 10, 15, and 20 years of service to Haywood County Schools with a $100 gift card. This year, Wood Valliere surprised 141 employees with gift cards. Employee recognition and retention is one of the main focuses of the Haywood County Schools Foundation. Each December, the Foundation recognizes employees who have reached certain career milestones with no break in service with gift cards. The money for the gift cards is raised by employees. At the beginning of the school year, employees have the option to donate to the Foundation through an annual pledge. Employees reaching years-of-service milestones will also be honored at an end-of-year reception in June. With one week until Christmas, children are excitedly chattering about what they hope to find under the tree from Santa Claus. For many children, Christmas is a day where their wishes and dreams come true. Unfortunately, many families in our area struggle to purchase presents for their children and pay their bills. Thanks to generous donations from local businesses and community members, Haywood County Schools students in need will experience the joy of the holiday season. For the past 31 years, the Haywood County Schools Foundation’s Sugar Plum Project has provided clothing and gifts to students in need during the holiday season. The Sugar Plum Project provides Christmas for pre-kindergarten, kindergarten, and first grade students enrolled in Haywood County Schools. Most of these children come from low-income families. From November 21 through December 8, children’s names were available on trees at United Community Bank, HomeTrust Bank, and Champion Credit Union. Generous community members picked out a name, bought items included on the child’s wish list, and returned it to the respective business on December 8. The Sugar Plum Project also accepted monetary donations to sponsor children. 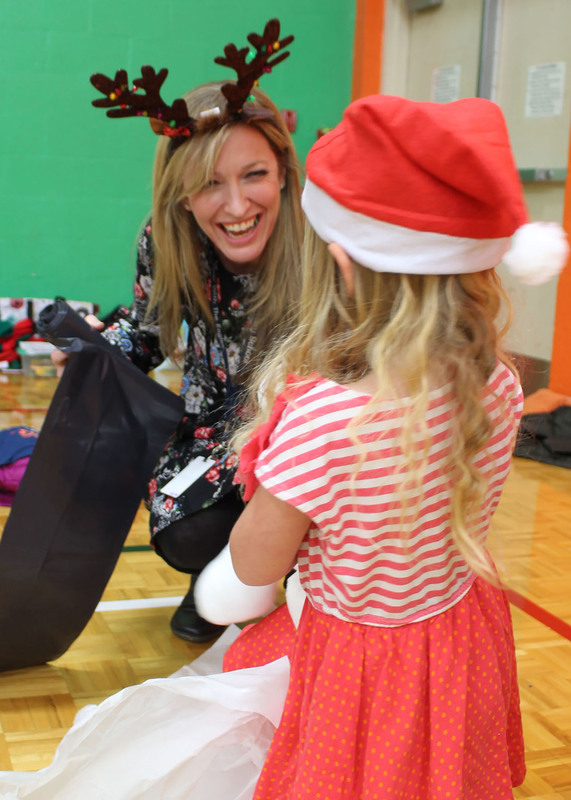 This year, through monetary and gift donations, 95 students received an early Christmas on December 13 at a Christmas celebration at the old Hazelwood gym. 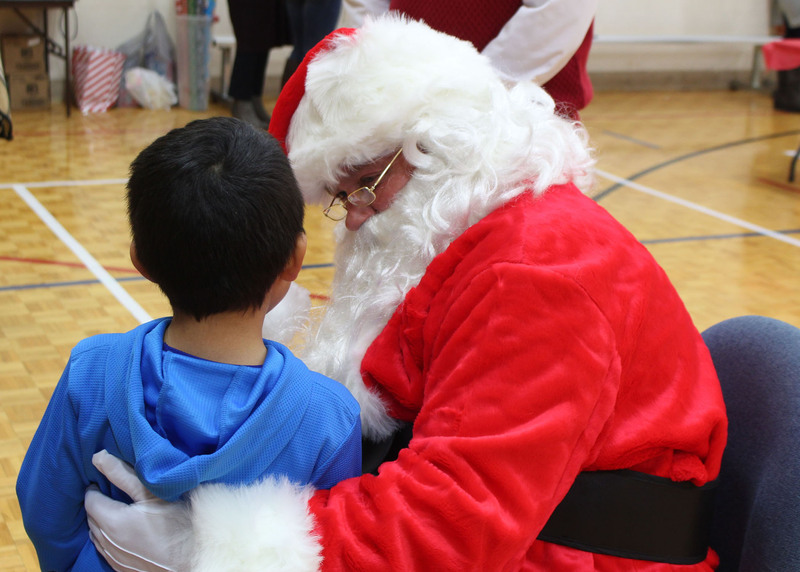 Students from the county’s eight elementary schools were treated to lunch, opened their gifts, and were surprised with a visit from Santa Claus. The children got the chance to talk with Santa and tell him about their Christmas lists. This is the first year that Haywood County Schools’ Academic Support Services Director Mark Sheppard has donned the red suit and beard as Santa Claus. Along with the Sugar Plum Project, Haywood County Schools has worked with Evergreen Packaging and police officers from Waynesville, Maggie Valley, Canton, and Clyde, Haywood County Sheriff’s officers, Highway Patrol, and Haywood County EMS to ensure all students will have a memorable holiday season. Over the past few months, the Haywood County Schools nutrition department has placed a special focus on student wellness, food variety, and local community support. Melanie Batchelor was hired as the school system’s nutrition supervisor dietitian in August 2017. 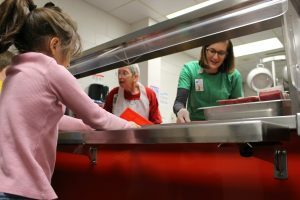 Since taking that position, Batchelor has been building on the already well-established child nutrition program to put together a strategic plan for designing menus for the county’s thousands of students who eat at school each day. Following the Healthy, Hunger Free Kids Act, the Haywood County Schools nutrition department has worked to increase the variety of vegetables and fruit, add more whole grains, and decrease foods with added sugar and saturated fat. Batchelor said the newest project she is most excited about is the introduction of salads into every school three days a week. Other new items on cafeteria menus are grab-and-go wraps made with vegetable-based tortillas and filled with things like egg salad. The Haywood County Schools nutrition department serves more than 2,400 breakfasts and 4,600 lunches each day. Of those thousands of meals served, 50 percent go to children who qualify for free or reduced lunch. Batchelor said the grain-based foods served by the school system’s cafeterias must be at least 50 percent whole grains, but she typically plans for 75 to 80 percent whole grains. Not only have students noticed healthier food options, they have also seen more variety in the menus. This year, Batchelor has implemented a five-week menu rotation. Batchelor has continued the school system’s relationship with the N.C. Farm to School Program. The N.C. Department of Agriculture & Consumer Services developed the Farm to School Program to give schools across the state the opportunity to receive fresh produce grown by local farmers. Haywood County Schools has received strawberries, watermelons, cantaloupes, apples, tomatoes, sweet potatoes, red and green cabbage, broccoli, sweet potatoes, blueberries and more that are grown on nearby farms because of the N.C. Farm to School Program. Batchelor’s job is not all about developing kid-friendly menus. While making sure food tastes good, she also has to meet cost and nutritional guidelines. Batchelor says her previous work experience as the health management programs coordinator for Harris Regional Hospital in Sylva, N.C. has helped prepare her for her job with Haywood County Schools. She is also a certified diabetes educator and registered dietitian with a master’s degree in health science. If you would like more information about Haywood County Schools nutrition department, visit www.haywood.k12.nc.us/school-nutrition/. The Haywood County Schools Foundation offers several ways that the public can contribute to programs that provide food for Haywood County Schools children in need. For more information, contact Executive Director Jenny Wood Valliere at 828-456-2400. Haywood County Schools Foundation gave 160 grants to teachers totaling $38,877 for the 2017-18 school year. 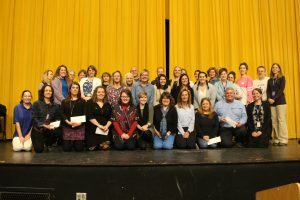 This year, grants were sponsored by Evergreen Packaging, First Citizens Banks, QuickDraw, the Arc of Haywood County, and the Haywood County Schools Foundation. 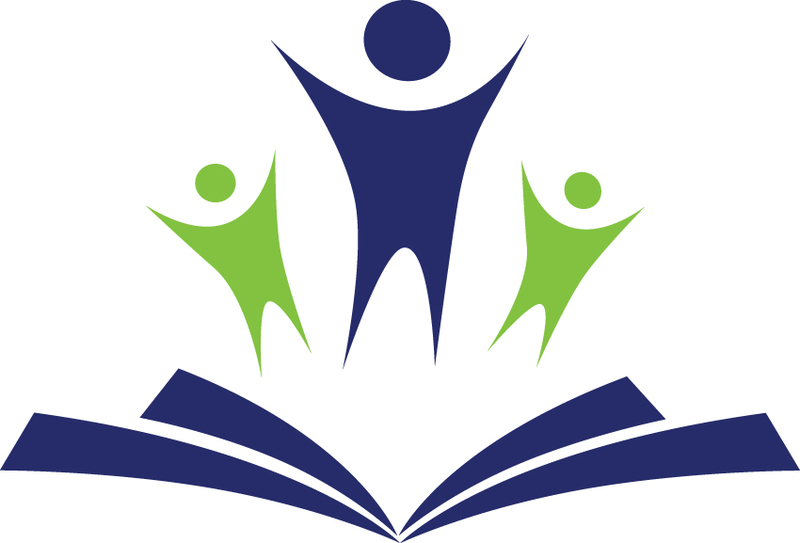 The grants fund resources for teachers and staff to enrich the learning experience for students. 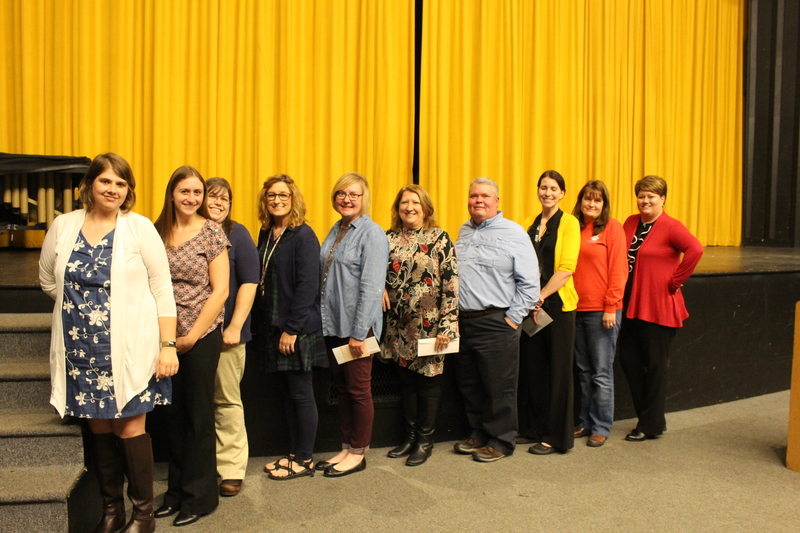 Teachers and staff from across the district applied for the grants this fall, and winners were selected after committees representing each grant reviewed applications. 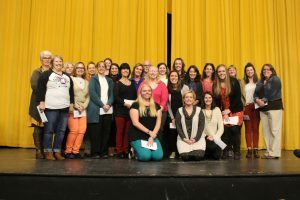 Teachers who won grants were invited to a Grant Recipient Reception at Tuscola High School on November 14. Keyes plans on having his students design posters and shirts. The classes will then pick a few designs to mass produce and sell for different school events. Grants ranged from $375 to fund assistive technology aids at Clyde Elementary, to $210 to purchase circuitry kits at Tuscola High School, to $199 for a renewable energy K’NEX set for the 3rd grade Academically and Intellectually Gifted (AIG) program. Each grant sponsor has different requirements and focuses of study. The QuickDraw art grant provides funds for art teachers to purchase materials for art education projects. The First Citizens Bank grant provides funding to schools and teachers for reading initiatives. The Evergreen Packaging grant focuses on projects that promote math and science. For the past five years, the Arc of Haywood County has provided grants to Haywood County Schools’ Exceptional Children (EC) teachers. This year, the Arc received 32 applications for grants and was able to fully fund each one, totaling nearly $11,000. Noal Castater, Career and Technical Education (CTE) teacher at Waynesville Middle School, has received several Haywood County Schools Foundation grants in the past. This year, he was awarded the Evergreen Packaging Math and Science grant, First Citizens Bank Reading grant, and Haywood County Schools Foundation Professional Development grant. 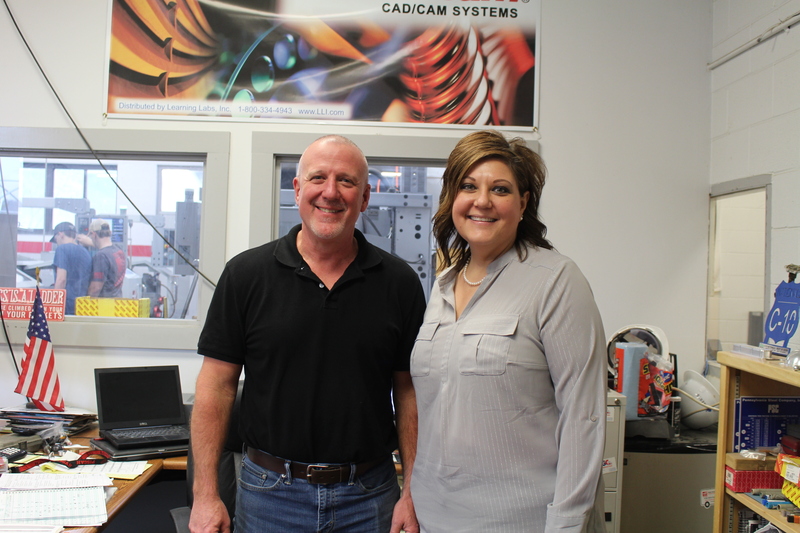 All the grants Castater was awarded were for different projects and workshops he plans to implement in his classroom. Using his $422 Evergreen Packaging Math and Science grant, Castater has developed an innovative packaging design project for his 330 middle school students. Students will learn the importance and widespread everyday use of how packaging design affects their lives by creating hands-on projects. They will start the unit by building basic boxes before advancing to complex foldable drag racers, airplanes, and rockets. Castater said the packaging projects will teach students the mathematical and scientific applications of geometric design, telescoping, creating tessellations, evaluating material strength and performance, converting two-dimensional drawings to three-dimensional products, and designing and building according to specifications. Castater plans to stress the importance of how to conserve resources by using as little material as possible to protect the environment. Students will also learn how these math and science activities relate to real-world applications in business, marketing, and the financial side of packaging with shipping, retail, mail order, and decorative designs. Superheroes, princesses, and book characters got off school buses and out of car line as elementary schools across Haywood County celebrated Book-O-Ween throughout the month of October. Held right before Halloween, Book-O-Ween is a tradition held at most of Haywood County Schools’ elementary schools as a way to incorporate literacy and learning into Halloween. 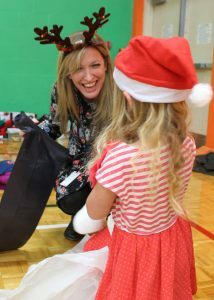 To the delight of students, many of the faculty and staff at each school also dressed up. This was the sixth year that Bethel Elementary School has held Book-O-Ween. At each school, students rotated through classrooms to listen to a variety of books. By the end of the day, students had heard anywhere from five to 10 different books, including favorites like Chicka Chicka Boom Boom, Frankenstein Makes a Sandwich, and Cat in the Hat. 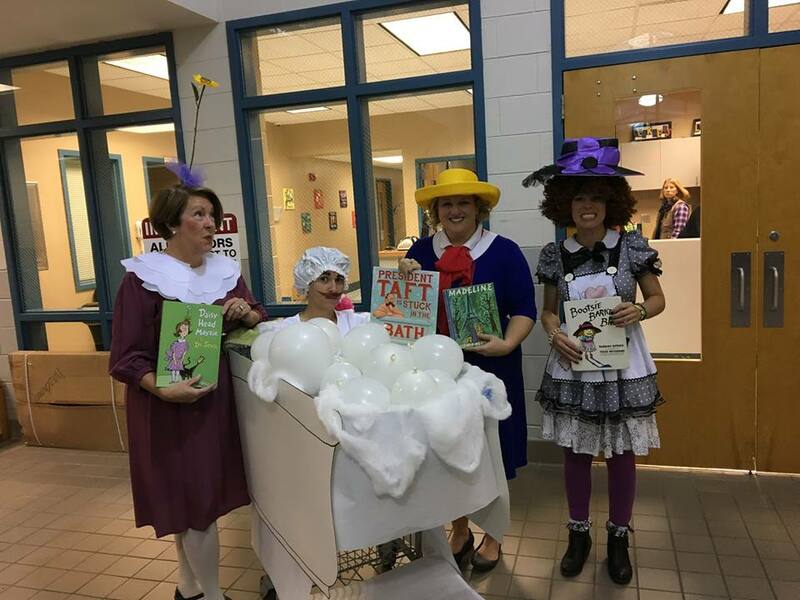 Along with school staff members, PTO and parent volunteers helped make the Book-O-Ween events at each school memorable for students. Jonathan and René Smith have recently created a new endowment with the Haywood County Schools Foundation. 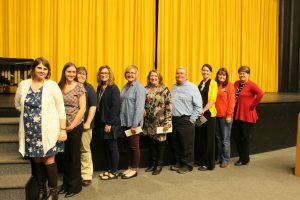 The Sam and Shirley Smith Instruction Program Endowment, which was funded with an initial gift of $30,000, will provide ongoing support for the instructional needs of Haywood County Schools’ teachers. The endowment is in honor of Sam Smith and in memory of his wife Shirley who passed away in January 2013. Jonathan, a healthcare administrator at the Jules Stein Eye Institute at the University of California, Los Angeles (UCLA), came up with the idea of honoring his parents with an educational endowment when his wife’s family did something similar for her parents. Initially Jonathan suggested setting up the endowment at a university, but Sam was quick to choose the Haywood County Schools Foundation as the beneficiary. He specifically wanted the money to be used for staff development and instructional support. Being a product of Haywood County Schools himself, Jonathan fully supported his father’s choice of the Haywood County Schools Foundation. Sam has a long history with Haywood County Schools. 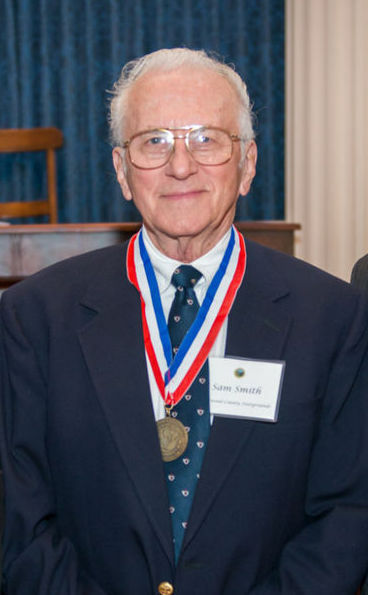 In 1983, Sam, then the school system’s associate superintendent, approached the Haywood County Board of Education with a proposal to create an educational foundation. Sam’s vision was to create an organization that would provide instructional resources for teachers that state funding was not covering. Thirty-four years later, the Haywood County Schools Foundation is the longest running public school educational foundation in North Carolina. It has grown to more than $2.5 million in assets and funds grants for teachers and staff, awards scholarships, and supports students in need. The Haywood County Schools Foundation currently manages more than 70 endowment and scholarship funds that have been established by businesses and individuals in the community. Endowed scholarships and grants are generated through the investment of permanently-held principals, so that only the income from the principal is used for awards. For more information about setting up an endowment fund or scholarship through the Haywood County Schools Foundation, contact Executive Director Jenny Wood Valliere at 828-456-2400 or visit www.hcsf.haywood.k12.nc.us. Several of Mary Mason’s third graders have never been to the beach, let alone another country. 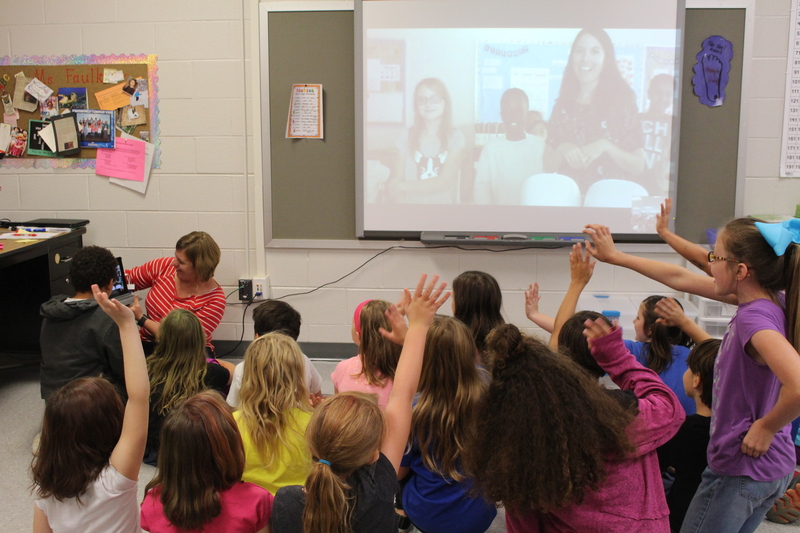 The ability to connect with students thousands of miles away was a key factor in Mason signing her class up for Global Read Aloud 2017. This is the second year Mason has participated in Global Read Aloud, a project where teachers around the world read the same book aloud to their students and then use technology to share the reading experience with other classrooms. The free six-week program began October 2. Each week, Mason reads several chapters of “The Wild Robot” by Peter Brown to her students. Afterwards, her third graders discuss their thoughts and feelings on the book with a classroom in Ontario, Canada. During their video call, students discussed their thoughts on the book’s main character Roz, a robot who has woken up on a remote island inhabited by unwelcoming wild animals. Classes in kindergarten, 1st grade, 2nd grade, 3rd grade, and 5th grade are participating in Global Read Aloud at Jonathan Valley Elementary. While the upper grades read “The Wild Robot,” the lower grades are reading a series of picture books by Mem Fox. Mason signed up for another year of Global Read Aloud with the main goal of exposing her rural students to a world beyond Haywood County. Mason believes that her students are not the only ones learning from the project. Mason encourages other teachers in the county to get involved in the project next year and not be afraid of the technology. Last year, Mason’s class enjoyed their partner classroom so much that they frequently communicated through the rest of the school year about different books outside of Global Read Aloud. This year, more than 600,000 students from all across the world are participating in Global Read Aloud. Since the Global Read Aloud’s inception in 2010, more than two million students from more than 60 different countries have participated. Members of the Church of Brethren National Older Adult Conference held at Lake Junaluska Assembly collected more than 1,200 books for Junaluska Elementary School as part of a local service project. This is the second time the conference has donated to the school. In 2015, Junaluska Elementary School Principal Sherri Arrington received a phone call from Debbie Eisenbise, organizer of the Church of Brethren National Older Adult Conference. After accepting the book donation, Arrington offered to give school tours to any interested conference members. Debbie and Jim Kinsey took Arrington up on her offer and visited the school before they went home to western Michigan. After getting a tour of the elementary school and talking with Arrington and the teachers, the Kinseys offered to donate even more books to the school. Over the past two years, the Kinseys have personally donated more than 3,000 books to Junaluska Elementary to build classroom libraries in each third, fourth, and fifth grade class, as well as the English as a Second Language (ESL) classroom. Libby purchased the bulk of the books for Junaluska Elementary while volunteering at the Scholastic Warehouse book sale that is held twice a year near her home. The Church of Brethren National Older Adult Conference meets at Lake Junaluska Assembly every other year. Once again, the conference chose to collect new books for Junaluska Elementary School students. Between donations from the conference and the Kinseys, Junaluska Elementary School has received more than 4,000 new books in two years. This year, conference members came to the school to read stories to each class. 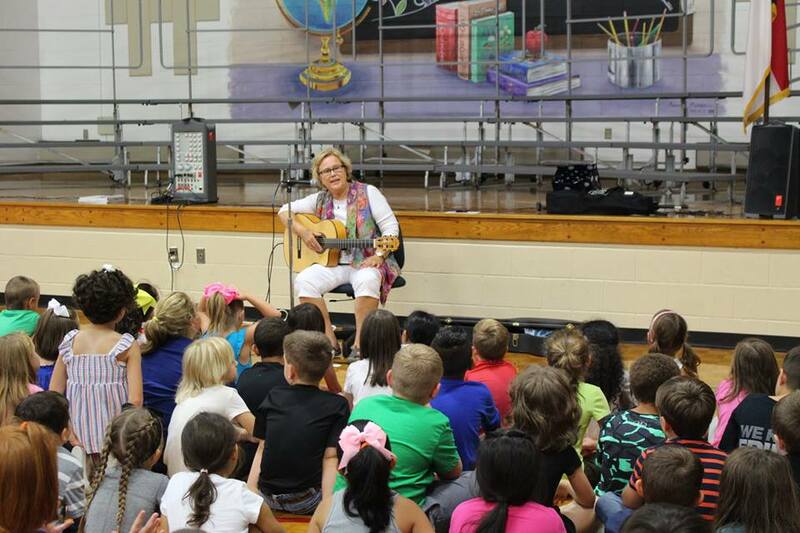 Libby also played guitar and sang songs to students in the gymnasium. This year’s keynote speaker at the conference and author of one of the books donated to Junaluska Elementary was also one of the volunteer readers. 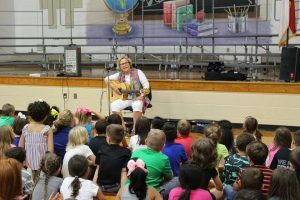 Peggy Reiff Miller read her book “The Seagoing Cowboy” to students in 5th and 2nd grade. When it comes to agriculture education, students at Central Haywood High School (CHHS) are learning about more than just the basics of growing crops and raising livestock. 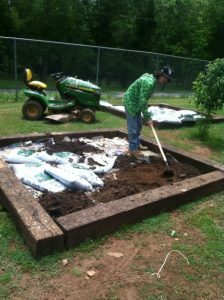 Under the leadership of Agriculture Education Teacher Barry Feldman, CHHS has revamped its ag education curriculum, gained new tools, and completed multiple outdoor projects around the school. This past school year, students in Feldman’s class improved and maintained a nearby riparian wetlands area – land that is adjacent to a body of water that supports vegetation dependent on large amounts of water in the soil. Feldman and his students discussed the importance of riparian zones to local ecology, environmental management, and civil engineering decisions. Feldman also received a grant to purchase mobile weather stations to monitor changing conditions, and created several specialized raised bed gardens. Feldman is looking forward to adding more garden tools and a new tractor with implements for his class in the 2017-18 school year. Special thanks to the following businesses and community members for their support of the CHHS agriculture program: Young’s Tractor and Equipment, Haywood EMC, Evergreen Packaging, Duke Energy, Carolina Farm Credit, Soil and Water Conservation District, Haywood County Farm Bureau, Kiwanis Club of Waynesville, North Carolina Tobacco Trust Fund Commission, Calvary Road Baptist Church (John Swanger & Mark Golden), Dellwood Baptist Church (Bobby Rogers), Graybeard’s Marine and Tractor (Greg Shelton), Clyde Alignment (Steve Schultz), Old Grouch’s Military Surplus (Tim Glance), Smoky Mountain Cremations (Amanda Della Savia & Ronnie Surreth), Asheville Mulch Yard (Daniel Pope), Sherrill’s Pioneer Restaurant (Dean, Lisa, Zeb, and Melody), Clyde Florist (Rhonda Smathers), David’s Home Entertainment (David Sutton), Junaluska Feed Center (David Farmer), Mac Sutton, Alan Shelton, and Jimmy Rodgers. Louis and Debbie Perrone, owners of Frankie’s Italian Trattoria in Maggie Valley, have dedicated the past three years of their lives to raising money and awareness for autism. During the month of April, Frankie’s, along with dozens of other local restaurants and businesses, raised nearly $60,000 for Richie’s Alliance, a non-profit the Perrones established in honor of their son, Richie, who has autism. 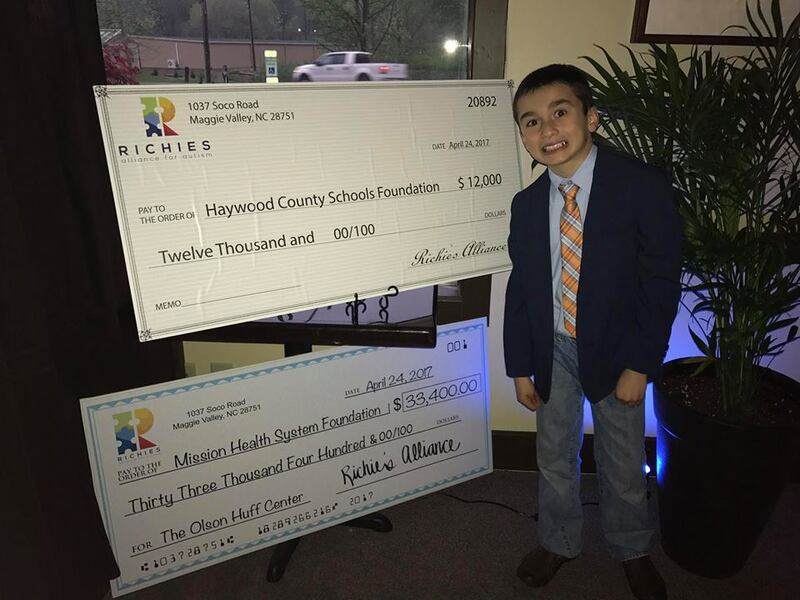 Of the $60,000 raised, Richie’s Alliance donated $12,000 to the Haywood County Schools Foundation, with the remainder going to the Olson Huff Center at Mission Children’s Hospital. 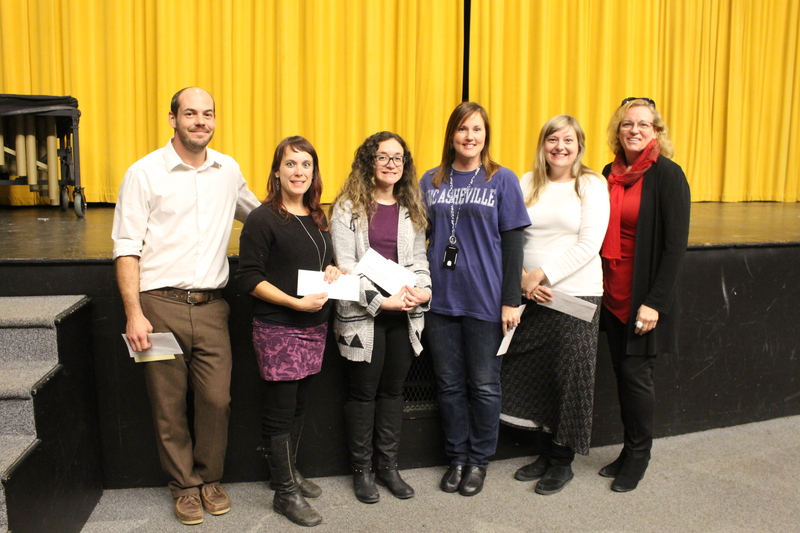 The donation to the Haywood County Schools Foundation will be used to support children requiring assistance in the Exceptional Children’s (EC) department and to create scholarships for two graduating seniors. Richie, who just finished up fifth grade at Jonathan Valley Elementary School, will enter sixth grade at Waynesville Middle School in August. The scholarships from Richie’s Alliance will each be worth $1,000 and will be open to any Haywood County Schools senior who has special needs. Haywood County Schools Foundation’s scholarship application will be available in January 2018 at each high school’s guidance center. The fundraising events for Richie’s Alliance are held in April each year in conjunction with National Autism Awareness Month and Richie’s own birthday. In 2015, Frankie’s and a few other restaurants raised about $5,000 for the Olson Huff Center with a Dine out for Autism event. The Perrones succeeded and raised $23,000 in 2016 and more than doubled that this year. Dozens of local restaurants from Maggie Valley to Dillsboro donated 10 percent of their revenue on April 12, 2017 for Dine out for Autism. That same day, 64 golfers hit the greens at Maggie Valley Country Club for the Casino Royale Autism Awareness Golf Tournament presented by Ken Wilson Ford. The final event, Taste presented by Biltmore Estate, featured dozens of restaurants, breweries, and wineries. Just the live and silent auctions alone at the Taste event raised nearly $30,000. Louis said his family is setting their sights even higher for 2018. Next year’s Richie’s Alliance fundraisers will be held the week of April 9, 2018. For more information, visit www.richiesalliance.org. For more information about the scholarships available through the Haywood County Schools Foundation or to make a donation, contact Jenny Wood Valliere at 828-452-2400 ext 2117.